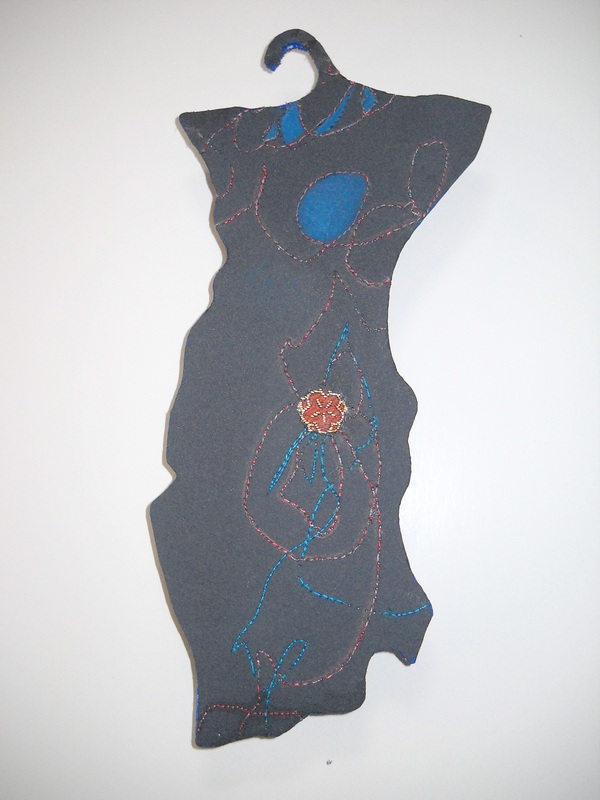 WPG artist Ellen Verdon Winkler is busy gearing up for her May solo exhibition, A Thing or Two. We just posted 18 of Ellen’s new prints on our website. You can see a few here, along with her artist statement, below. Mark your calendars for her Opening Reception on May 5th! Most of the work prepared for this show was done in the last 12 months. The work began with monotypes done in Rock Creek Park. They were studies of the rock formations that line the creek. I thought it would be interesting to try one of those images as an etching, so I began to focus my attention on the various intaglio methods. The work included a number of landscapes and outdoor scenes, and several prints done from sketches of riders on the subway. As winter approached and I was unable to continue working out of doors, I began studies of small objects. Some of these were from my garden, but one was an object that I found in the street on a gray November day… a lost pompom. I rescued that item, and began to work with it and with other things I found or made. My concern was not the object itself, but the marks I was making to describe it. 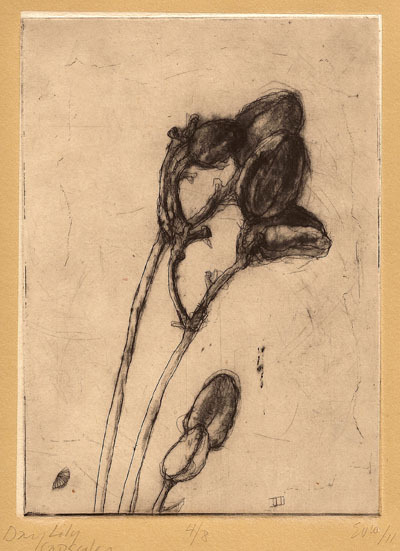 Those marks were made with techniques that included drypoint, hard and soft ground, and engraving. My greatest interest in the works in this show is in texture of the prints. Engraving particularly leaves a thick ropey line of ink on the surface of the print. The surface marks are unique to hand pulled prints and have fascinated me because of the added dimension of “data” embedded in the print. 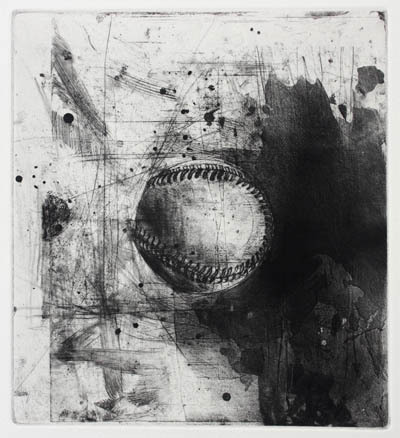 New artist member Dean Russell Thompson is a multi-talented artist–creating works using lithography, woodcut, and the interesting process of galvanic etching. First, an image is transferred to a metal plate. The most common (maybe only?) way we have heard of is using an image printed using a laser printer and ironing it onto a metal plate. The heat of the iron sticks the toner to the plate, and the paper can then be soaked off. The plate with the toner image is then put on exposed wiring or a metal grid and immersed in a solution of water and copper sulfate. The wiring is connected to a battery (lawnmower, car, etc). When the battery is turned on, a charge runs through the wire and the plate. Anywhere there is toner, the brass stays in place. All exposed areas are bitten away, as the acid does in a traditional etching process. The result is a plate that can hold ink just like a traditional etching. From here on out, printing the place is the same as printing any other intaglio plate. If you’re interested in learning more about this process, we found the most helpful website to be by Steampunk Workshop, which goes into way more detail than we have here. 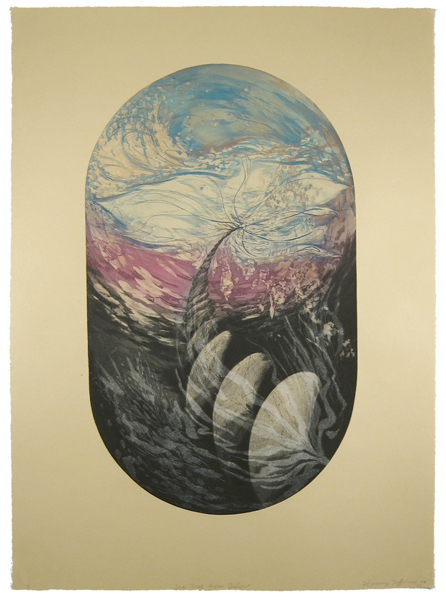 You can see examples of Dean’s galvanic etchings in the gallery and on our website. Below is a quick introduction to each of the artist pairs in Director’s Cut. A version of this write-up will be in our first-ever quarterly client newsletter, coming soon! September’s Director’s Cut Exhibition features 44 prints by 10 different artists. 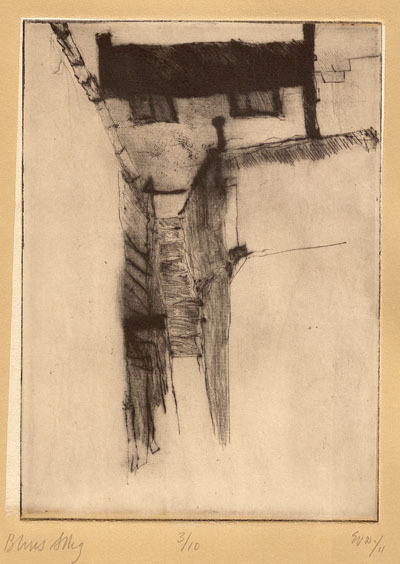 Techniques include intaglio, chine colle, collagraph, screenprint, mezzotint, and monotype. 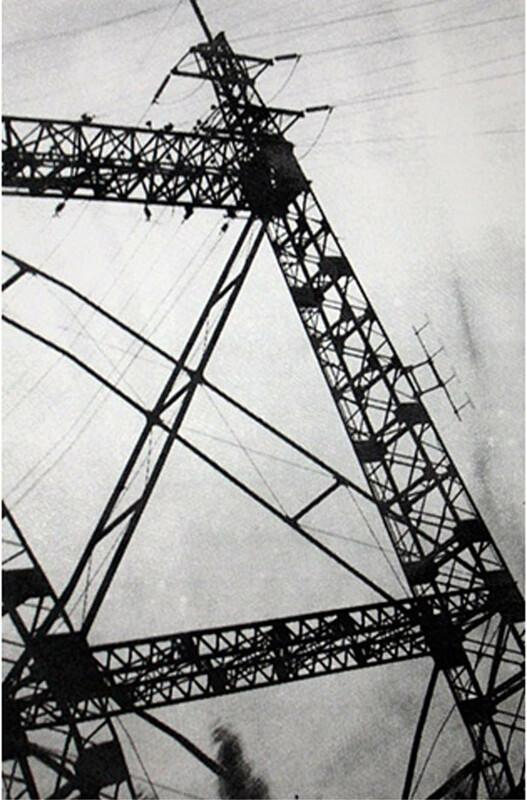 These artists were grouped into pairs based upon complementary aspects of their work. Kristen Necessary and Pauline Jakobsberg both use memory and remnants of past lives for inspiration in their prints. Kristen draws upon the abandoned houses in rural southwest Virginia, where she grew up, while Pauline uses clothing. While Pauline has explored memory through her collagraph clothing prints for some time now, she recently began cutting these prints out, making them into unique art objects. Both artists create work that is intimate, beautiful, and sometimes eerie. Kristen lives in Iowa City, IA, and Pauline lives in the DC area. Andrew Kozlowski and Fleming Jeffries both create strange and fantastical scenes in their prints. In this exhibition Andy’s two silkscreens (he does use a variety of media not included in this show) look like they could be the aftermath of one of Fleming’s landscapes. Fleming’s landscapes use common elements, such as rock formations and rivers, but in a way that makes the space alien and uninhabitable, and almost self-destructive. The debris floating in Andy’s alien space speaks to the world already destroyed. 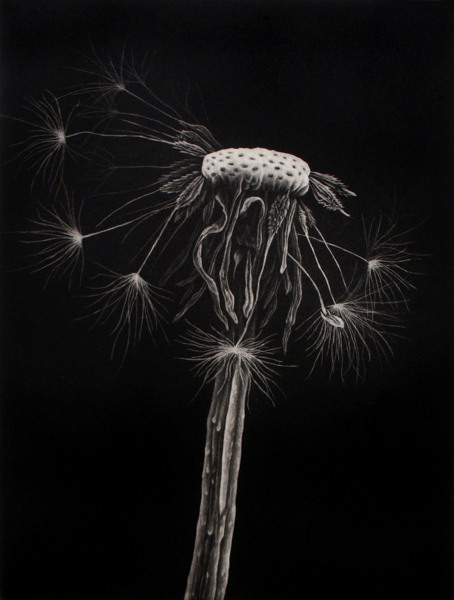 Andy lives in Richmond, VA and Fleming lives in The Plains, VA.
Jake Muirhead and Julie Niskanen were both included in this exhibition for their exceptional draftsmanship in their still life. Still life is a genre centuries old, but Julie and Jake both breathe new life into it. Jake starts with a quick sketch on the copper plate and builds his image up with subsequent aquatints and etching, creating an image that is both free and precise at the same time. After the time-consuming process of rocking a mezzotint completely black, Julie carefully scrapes the image back in. Jake lives in the DC area and Julie lives in Raleigh, NC. Lindsay McCulloch and Yolanda Frederikse are both landscape artists, and both have worked with DC imagery (though not all of Lindsay’s prints in this show are of DC). Their similarities stop there, but both their landscapes are still enjoyable. 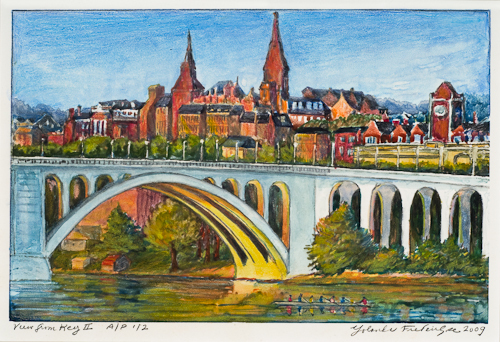 Yolanda uses a unique water-color based monotype to depict everyday scenes at recognizable landmarks, while Lindsay uses silkscreen to draw the viewers’ attention to the design in everyday infrastructure. Lindsay and Yolanda both live in the DC area. 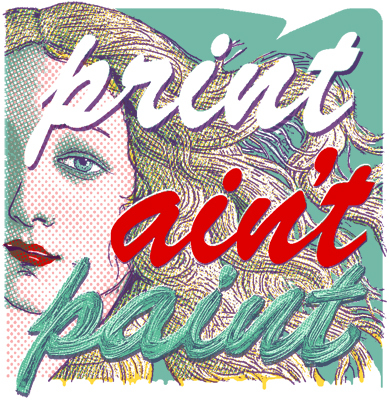 Mike Hagan and Glenn Fry are both silkscreen artists. 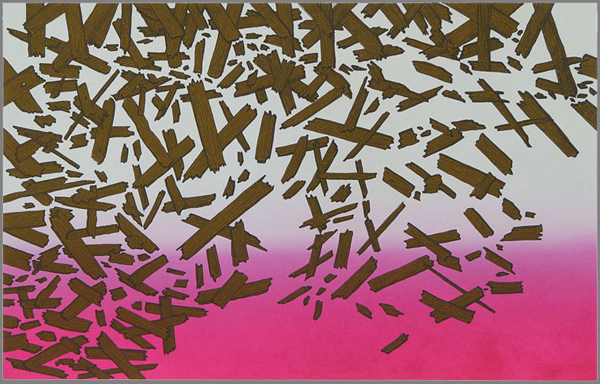 Silkscreen is strongly tied to graphic design, which Glenn has a background in. 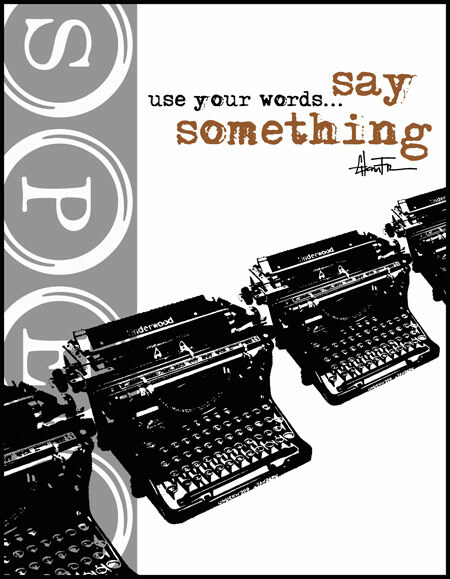 This influence can be seen in his poster size prints with bold but limited use of color and heavy reliance on text. Mike’s prints have many references to pop culture, including Marilyn Monroe and comic books. Both artists’ prints have an immediate aesthetic appeal, but deeper levels of meaning can be obtained from both of them upon a second look. Both Mike and Glenn live in the DC area. My taste in art changes drastically based on the mood I am in. When I am feeling introspective I prefer artists that render abstract images- I want to be able to look at a piece and let my mind wander, I don’t want to be held back by communal notions created and attached to objects and images easily decipherable. Other days I want something more immediate- I want to look at a beautiful, identifiable landscape or portrait- I want to just enjoy the work the Artist has already done for me. Today is one of those days where my mind is not looking to search for meaning in nebulous images, shapes and forms but instead it prefers to let my eyes feast on a beautiful image in front of me- today is a Gabriel Jules type of day. 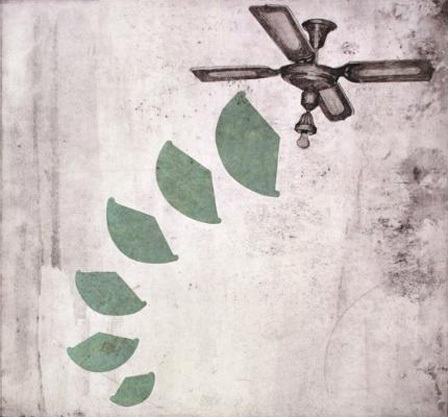 Gabriel Jules’ beautiful etchings tend to feature landscapes, as well as the occasional animal. What I enjoy most about her work is her ability to create an image that is simultaneously calming and engaging. Her use of aquatint throughout his collection creates vast texture and depth, helping the viewer decipher the composition of the print. 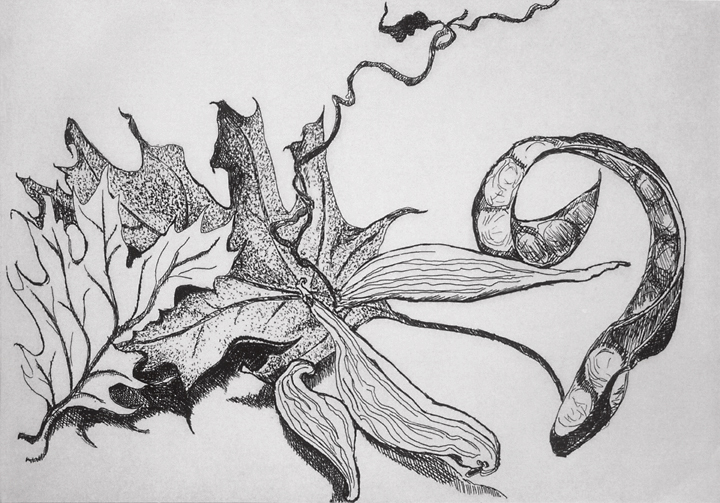 Of Jules’ work, my favorite piece is titled “Autumn Medley,” a black and white still-life etching. The details are innumerable; every time I happen upon it I seem to find even more detail that I did not see the last time. Director’s note: The above was written by WPG summer intern Loey Bleich, art student at University of Virginia. If you are interested in seeing more prints by Gabriel Jules, please contact the gallery.